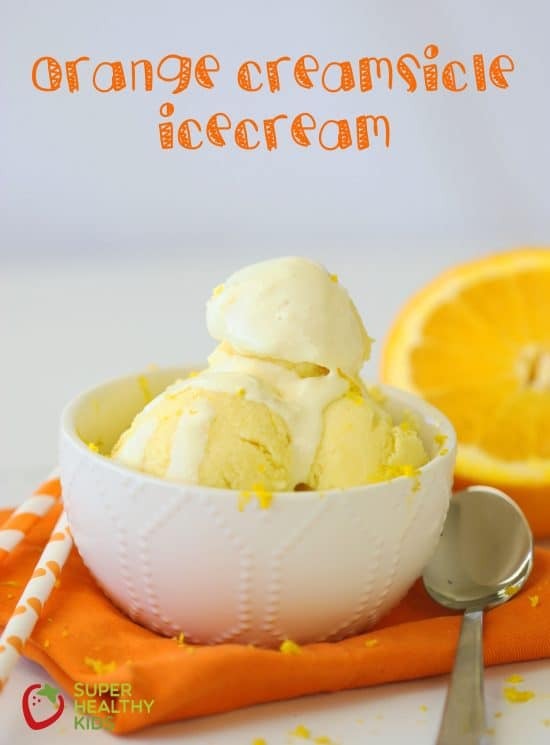 This orange creamsicle treat is delicious! My two younger kids love oranges and will eat them in any form – cuties, navel oranges, peeled, sliced, canned, in a smoothie…… But my oldest daughter is super picky about fruit and textures and will not eat oranges. I love being able to create recipes with whole fruit that include all those good nutrients, but change the texture so that she will eat it! This ice cream is literally the easiest thing to make. A couple of hours before you want to make this, peel and section 2 oranges. Lay them flat on a tray and freeze until solid. Once they are frozen, pour one can of coconut milk into your blender. I LOVE my Blendtec. I literally use it every singe day. There are SO many things you can make in it and it just works so well. Add half the frozen oranges and blend. Then add the other half and continue blending. Add the rest of the ingredients. Then pour into a container that you can freeze. I used a glass bread pan and it worked great! Freeze until it has hardened – a couple of hours is all it takes. Peel and section oranges. Lay flat on a tray and freeze until hardened. 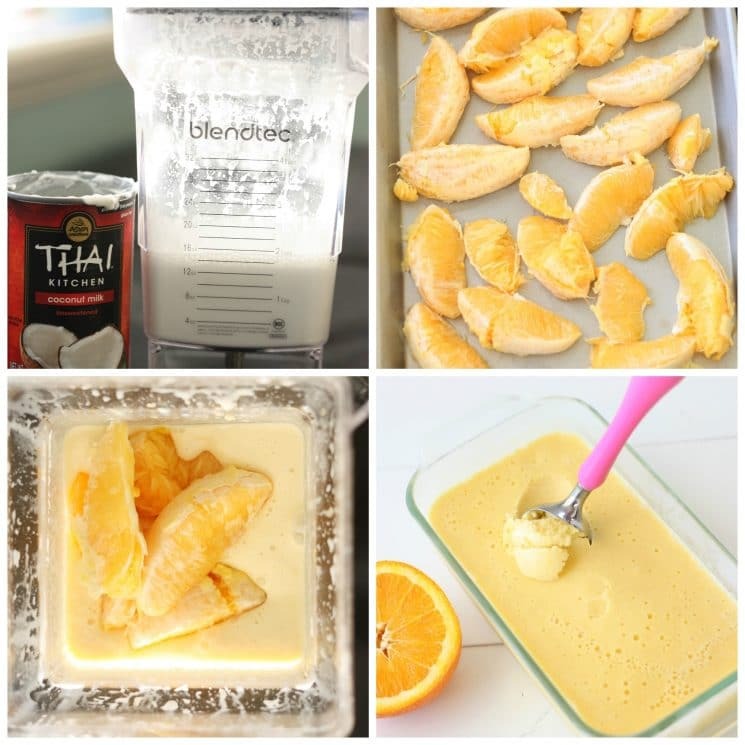 In a blender, add coconut milk and half of the frozen orange sections. Blend until smooth. Add the remaining oranges and continue blending. Add the sweetener of your choice (honey, powdered sugar, maple syrup) and vanilla extract. Pour into a freezer safe container and freeze until solid. When ready to serve, let it sit out for a few minutes to make it easier to scoop. Enjoy! I haven’t tried it, but I’m sure it would work great! The reason homemade ice cream gets ice crystals in it, is because the longer it takes to actually freeze, the more room for air and ice crystals are able to form. -Higher fat content of the ice cream. Fat doesn’t typically freeze if there is a low water content and so it helps make it smoother and creamier and less icy. Make sure you are using a full fat coconut milk. -Sugar. A higher sugar content and type of sugar produces a less icy ice cream. -Quick freezing. The faster the ice cream freezes after it is done, the less ice crystals will form. You can freeze the container it will go in ahead of time, and then put it in the coldest part of your freezer immediately after it gets done in the blender. Have you tried this? It sounds great and want to try myself! Natalie – AMAZING recipe. I love it and I’ve posted this to my blog and emailed the recipe (directly linking here) to about 20,000 parents. Hope that drives some appreciative traffic your way. Nicole – while you probably could use almond milk I think you’ll have a hard time making it into ice cream. Almond milk is mostly water, so it will freeze into a big block of ice. Coconut milk is much higher in fat (healthy medium-chain triglycerides) and when frozen it doesn’t quite turn into the same block of ice that almond milk will. Also, if you use just almond milk you’ll be taking away all of the healthy fat calories (or practically all) and these are what satifsy hunger. I wouldn’t do it unless you can’t use coconut milk. Thanks Chris!! And thank you for the tips! I love my blendtec too! To freeze faster you can just add ice and use the ice cream setting. Quick results! Which kind of coconut milk? My hub brought home the unsweetened coconut milk in the can from Taste of Thai. I used Thai Kitchen, but I’m sure Taste of Thai will work just great. Just made this sooooo good! We actually never use stevia, and so I can’t really give you advice on that! Thanks for this recipe! I am excited to try it for my niece’s 2nd birthday as she is sensitive to soy and dairy (to the point of intolerance.) I was wondering if you had thought of or tried it with other fruits? What’s your opinion? She is in LOVE with apples at the moment and as odd as it may sound that sounds yummy to me lol. Thanks again. You could definitely try it – honestly I’m not really sure how it would turn out. I would probably soften the apple just a bit before blending it! Soften apples and add cinnamon. Yummy! 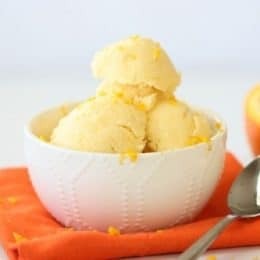 Would frozen oranges be best for making orange ice cream? Or would refrigerated oranges be best? We want to bring out the best flavor and quality possible. Frozen worked well for us. I’m sure fresh would work just great, it may make the mixture thinner because of more moisture requiring more freezing time and an icier texture. If you try it, let us know how it turns out! Could you use regular dairy milk here? My son has allergies to coconut and nuts. Maria – yes you can use regular dairy milk, but I would suggest half and half or cream. The higher fat content will give it a creamier and much less icy texture. Thank you! Coconut milk is non-dairy and is lactose free. You should be able to use that just fine. I’m not familiar with Zymil. Have you found that one type of orange over another tastes better? Definitely need to try this with my highly lactose-intohlerant 4yo!! Sweetener is a bigger poisen than sugar. Apart from that great job! Nicole – I’m not sure what you are referring to as a sweetener, but when we say ‘sweetener’ we are referring to honey, maple syrup, coconut sugar – not refined sugars or artificial sweeteners. 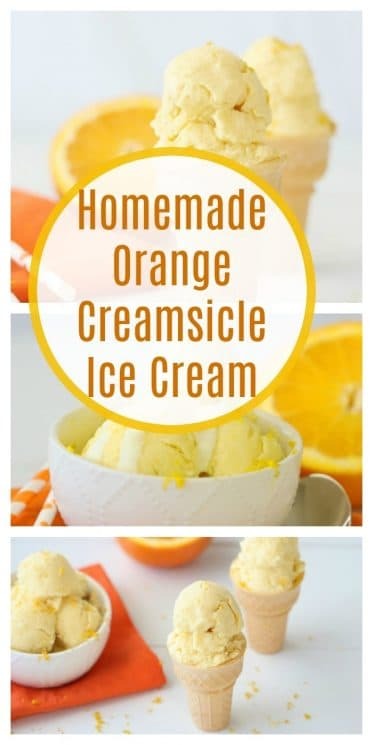 Hi, normaly I would squeeze the oranges and freeze it with other ingredients and then remove from freezer and blend it and refreeze, this way is a lot easier, but I can’t use any kind of milk, what would u suggest? Do you have a dairy allergy? I’m wondering about other fruits. I love orange sherbet but I also love lemon, lime (which I assume would be similar), strawberry or any other fruit really. It would be nice to be able to switch things up and make not just orange. Have you used other fruits?? 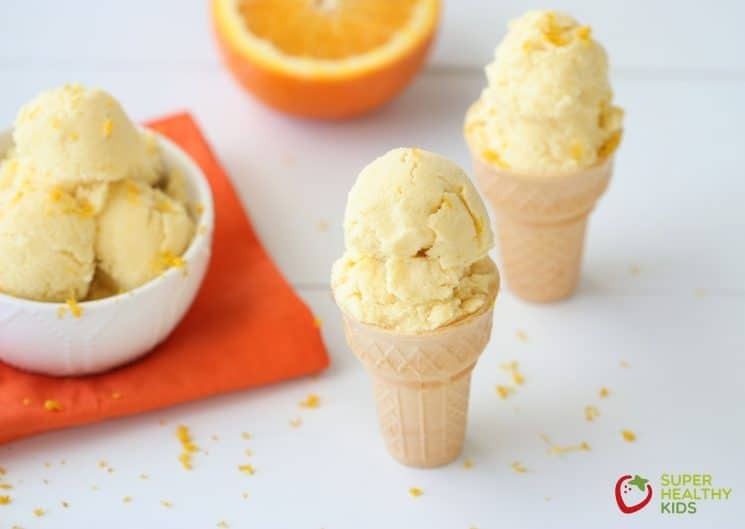 We haven’t tried this recipe with other fruits, but we have with lots of other ice creams. Definitely give it a try! Thanks for the recipe – very nice! Do you know how long it would last in the freezer? I would say it will stay good for 2 weeks. Definately a sherbet and not ice cream. Consistency was icy and not creamy (in, sherberty). I used extra sweetner due to tart oranges. Make sure it’s sweet enough before freezing as it gets less sweet when frozen. Very good, will make again. I made it and even used a glass air tight container and it had ice crystals in it.. Did I do something wrong? Which sweetener do you think works/tastes best? We have coconut sugar, honey, and Maple syrup in the house, not sure which to try. Personally I prefer the taste of either coconut sugar or honey. I use honey when I make it. Natalie, in regards to the sweetener, do you add the vanilla extract along with something like honey? Or do you just add the honey? Yes – I think vanilla extract would be really yummy with honey. I have made something similar using blueberries, coconut milk, and maple syrup….if you can handle eggs, you can blend in an egg to make it creamier. I would post the link, but the blog I got it from is no longer active. Any frozen fruit works. would a vitamix work just as well? Yep! It will work great. Could you be a bit more specific with the oranges? Maybe listing weight or cups so that I can have a reference. I really want to try it, but I am always afraid of messing up and wasting. Thank you very much for this great idea! This recipe doesn’t have to be to the exact measurement. I used 2 oranges that were medium in size, but if you have 2 oranges that are large it won’t be a problem! When you said “coconut milk, full fat”, do you mean using the white coconut cream not the coconut water in the can? As oranges are really sweet right now in my market, I’m going to try this recipe. I have a Vitamix so I’m wondering if I can add the oranges all at once instead of how its listed in the directions. Also, what is the total servings that this recipe makes? Thanks. Yes – if your blender is powerful enough, you can definitely add them all at once. It makes about 8 1/2 cup servings. YUM! My husband and I are making a whole bunch of ice cream flavors for my daughter’s 3rd birthday party next weekend and I just had to try this. 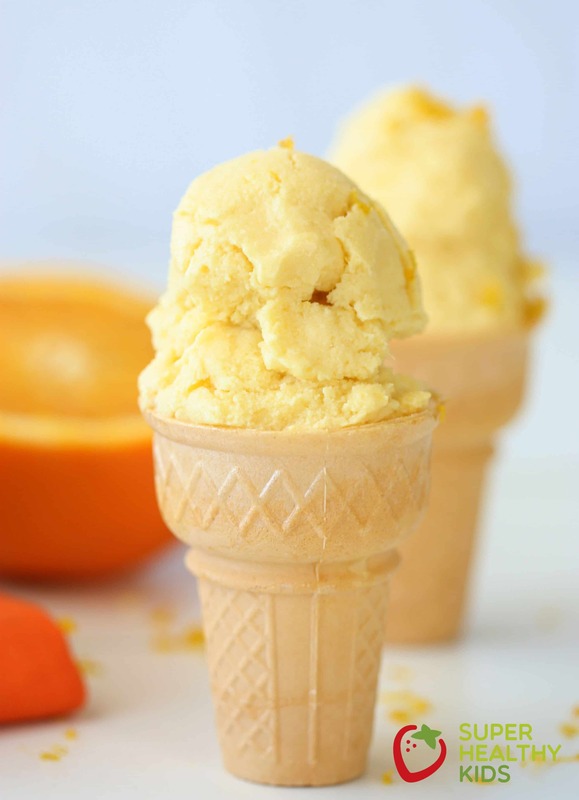 I LOVE orange creamsicles, and this is such a fabulous, healthy way to satisfy that craving. Absolutely delicious . I will be making this again! how long before it goes off? I’m not sure I understand what you are asking?? I did this with heavy cream and bananas instead of oranges. It was amazing. I loved this recipe! As did my little girls! That said, despite following the recipe exactly (full fat coconut milk, etc) , it was definitely more icy /crystallized/rock solid than ice cream even after it sat out. Luckily I had put half into Popsicle trays and the rest in a glass container so the girls loved eating them as Popsicles, and then I just had to scrape and scrape to get the frozen block out of the glass bowl. But it was still very tasty! Can’t wait to try it with strawberries too! I just made this and it is awesome. Love love the flavor!! I make this with full cream coconut milk or normal dairy whipping cream. Have used frozen oranges, strawberries, blueberries, cranberries, raspberries, mango and i have also added coconut, cocao, nuts etc. Have end chopped up chocolate buttons and put through it. Use your imagination ? Does it have a noticeable coconut taste? If so, could I substitute the coconut milk with cashew cream? Will it still be as creamy? Cashews have a higher fat content, and so it would probably work. I have noticed though that cashew cream tends to be a little bit on the liquidy side – this could result in a bit more ice crystals. Always an experiment! If I use full fat coconut milk, will it overpower the orange creamsicle flavor? Is the coconut noticeable at all? Yes – it might not get as creamy but should still work fine. Hi! I was wondering if it is good fresh out of the blender- like a milkshake? Can I throw this into my ice cream to be able to have the kids help and move it along faster? How much does this make? I’ve got a lot of people in my family. I used 1 cup of the hard coconut from the can of native forest coconut milk. I used one cup of fresh squeezed orange juice. 3/4 teaspoon vanilla and 10 drops of liquid stevia. It was amazing!! Will Lemon work instead of orange? I made your recipe and changed it up and added 4 drops doTERRA orange and 4 drops ginger essential oils. I won 2nd prize in an icecream contest. Next time I will try the recipe with my Kitchen aid ice cream maker. The delicious and nutritious recipe, my children were delighted with the taste of this delicacy. I advise everyone to try at least once. Thank you so much Natalie. Such a delicious and healthy dessert, I tried your recipe, it turned out very nice. Thanks a bunch :)….. 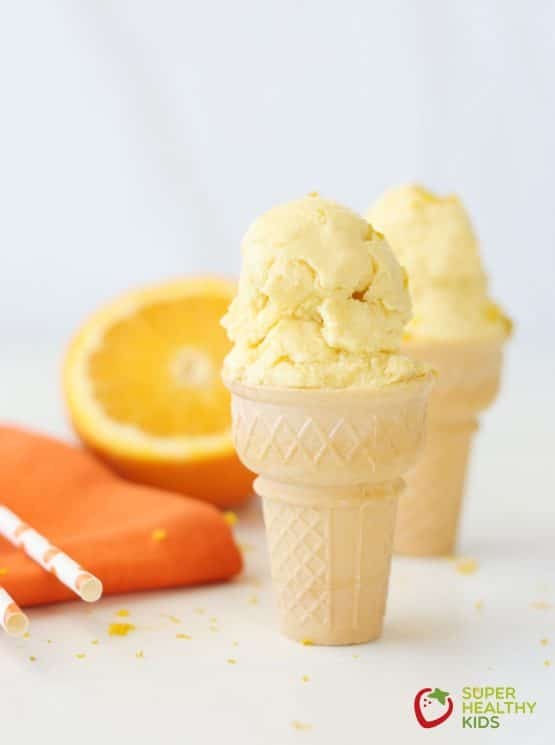 This orange creamsicle ice Cream recipe is great, I cooked it with my son and it was delicious! Thank you for sharing and for providing us with step-by-step directions. These look absolutely delicious! You have amazing food photography too :] As much as I know my girl’s will love these.